CHICAGO – Face it, fellow modernists, we live on our screens. 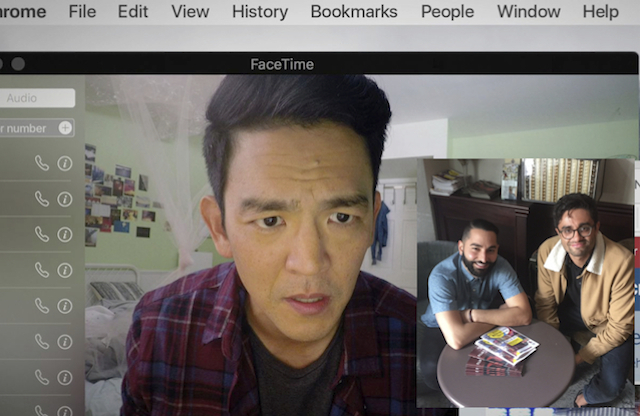 It was inevitable that entire films would soon be set there, and the latest is “Searching.” Combining the nightmare of a missing teenager with the abilities of social media, cameras and devices, filmmakers Aneesh Chaganty and Sev Ohanian “screen it” to the max. With the actions taking place all on screens, David Kim (John Cho) is a single Dad who is coping with the loss of his wife. His daughter Margot (Michelle La) seems to be a stable teen, until one night she doesn’t check in. Through circumstances, David doesn’t realize she’s missing until the next morning, and is assigned the detached Detective Vick (Debra Messing) when he goes to the police. The inaction of law enforcement frustrates him, so he begins to dig online for any clue to his daughter’s whereabouts. Pixel by digital pixel he begins to recreate the events of Margot’s life before the disappearance, and his findings even gets Vick more involved. This is the debut feature film of “Searching” creators Sev Ohanian and Aneesh Chaganty (who also directed). From the germ of the idea, the two filmmakers built the process of storytelling and visual structure based only on screens. The concept is intently plausible in today’s environment (they even throw in the old fashioned TV screen), and the tense thriller is something perhaps Alfred Hitchcock may have tried had he worked in the digital age. John Cho and Debra Messing also play against their types, and both turn in memorable performances. In PART ONE of the HollywoodChicago.com Podtalk with Patrick McDonald, “Searching” creators Aneesh Chaganty (answering first question) and Sev Ohanian (second) talk the progression of the idea, filming techniques and web privacy. In PART TWO, the creators talk about ‘Big Brother,’ parenting in the social media era and the performances of John Cho and Debra Messing.